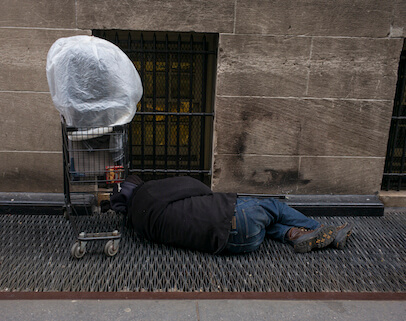 In New York City, a homeless man sleeping on top of a heating grate, 2018. A recent United Nations report claims that 18.5 million people are living in “extreme poverty” in the United States. The report met with stiff backlash, especially from U.S. ambassador to the United Nations Nikki Haley. Ambassador Haley asserted that a mere 250,000 Americans were extremely poor. Haley faulted the UN researchers for not taking into consideration important factors besides direct income that add to what poor people have to live on. Those who accepted the report’s conclusions criticized the Trump administration for minimizing a serious social problem. Analysis of poverty is not “an exact science” and so requires careful study; different measures and methods are used. The U.S. Census Bureau issues data on the “poverty line” and rates of poverty. It defines “extreme poverty” as having an income lower than half the official poverty line. For 2016, that was about $12,000 a year for a family of four. (The UN report cited the Census Bureau’s official statistics.) The World Bank, which focuses on poverty for the United Nations, defines “extreme poverty” as living on less than $1.90 a day. The 2015 book $2 a Day: Living on Almost Nothing in America applied a similar measure, finding that about 1.5 million American households were extremely poor. In responding to the UN report, Haley called it “misleading and politically motivated.” For her figure of 250,000 in extreme poverty, she relied on a study by the Heritage Foundation. Research by this conservative think tank defines “deep poverty” as living on less than $4 a day. It takes account of government social spending that helps the poor, such as Medicaid, food stamps (also known as SNAP, for Supplemental Nutrition Assistance Program), and housing assistance. The counting of people in poverty is also problematic because family support often is not taken into consideration, and because people tend to underreport their reliance on welfare when answering surveys. However, the research of one Princeton University economist,Nikk who also used the measure of less than $4 a day and factored in support received through government transfers, found that about 5.3 million Americans are in extreme poverty. The U.N. Says 18.5 Million Americans Are in “Extreme Poverty.” Trump’s Team Says Just 250,000 Are. This article covers the controversial UN report on poverty in America and the official reactions to it. This article includes a short video interview with one coauthor of $2.00 a Day. Did We Really Reduce Extreme Poverty by Half in 30 Years? This fact-check analysis looks at the major reductions in extreme poverty worldwide in recent years. U.S. government “clearinghouse” on data concerning poverty in America. The most recent comprehensive Census Bureau statistical report on poverty in America.